Our delivery fleet operates as Coppercoin Transportation, Inc which is a fully licensed and insured trucking company. Our trucks run across the North Central United States picking up and delivering our products as well as other commercial goods. We operate a fleet of live bottom, self unloading trailers. These open top, tarped trailers are capable of hauling both van freight from docks or loose bulk commodities such as wood chips and other agricultural commodities. 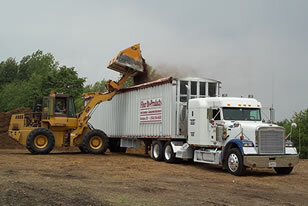 The trailers are equipped with attachable hoppers to make unloading bulk grain into a pit or an elevator a breeze. ©2007 - 2010 Fiber By-Products, Inc. Sitemap. Designed by Identity Graphic Design.